Nothing warms you up like a hearty and satisfying bowl of delicious soup on a chilly day and our Butternut Squash Soup is as colorful and rich-tasting as it is filling and flavorful. Get the Butternut Squash Soup recipe here! Butternut squash is loved for its mild, creamy, orange-yellow flesh and sweet, nutty taste. Good-quality butternut squash should be firm, smooth-skinned and heavy for its size. Low in calories, rich in fiber and with almost no fat, butternut squash is loaded with antioxidants, such as beta carotene and contains more than 350 percent of the recommended daily allowance (RDA) of vitamin A in just one cup. This luscious squash is also a great source of lutein and zeaxanthin, two powerful antioxidants that can also protect vision. A good source of vitamin E, vitamin B-6, thiamin, niacin, folate, pantothenic acid and manganese, just one cup of cubed butternut squash contains 582 mg of potassium, that’s more potassium than in a banana! Getting at the flesh of winter squash can seem daunting. You will need a sharp knife and a vegetable peeler. Place the squash on its side, stabilizing it with one hand (fingers tucked under) and slice off both ends. Do this by making an initial cut into the squash, just penetrating the skin with as little pressure as possible. Once the knife is through the skin, you can lean heavily into it to complete the cut. Divide the squash lengthwise and scoop out the seeds. At this point you can run the peeler down the length of the squash, until all the peel is removed. You may then cube the flesh. 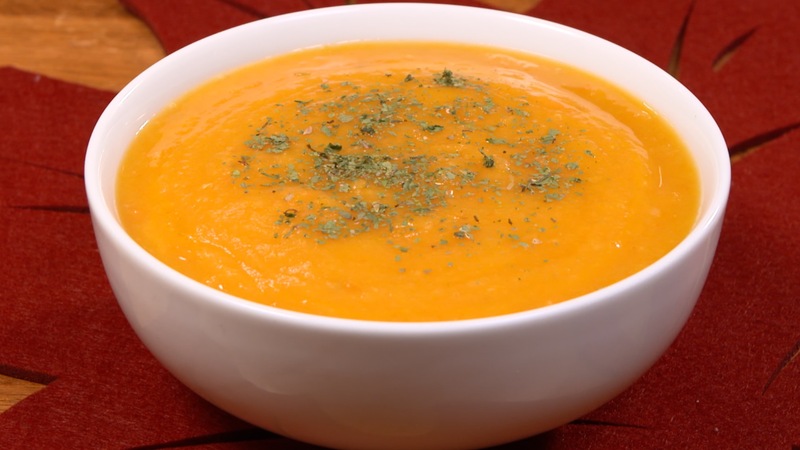 Soup making is a simple process and this one-pot recipe calls for the squash, carrots and potatoes to be braised with the aromatics and pureed using an immersion blender. The soup is finished with tasty nutritional yeast and Marukan Seasoned Gourmet Rice Vinegar adding elegant flavor notes and delicate balance to this luscious soup. Marie Oser is a best-selling author, writer/producer and host of VegTV. Her latest book is The Skinny on Soy. Follow Marie on Facebook and Twitter.